A string of high mountains divides this Greek isle into four regions, each with its own distinct landscape. 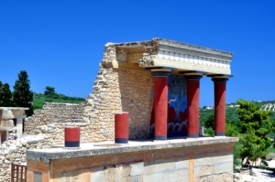 Half-day excursions visit two main attractions -- the restored 4,000-year-old Minoan palace of Knossos and the unparalleled archaeological museum in Heraklion. Tourists venturing out on their own may want to visit the colorful fruit and vegetable market or drive to a quaint fishing village.